A new Arduino educational robotics kit called Blinkgogo, has been launched this week which has been specifically designed for STEM education and allows children to play while learning more about the fundamentals of robotics. 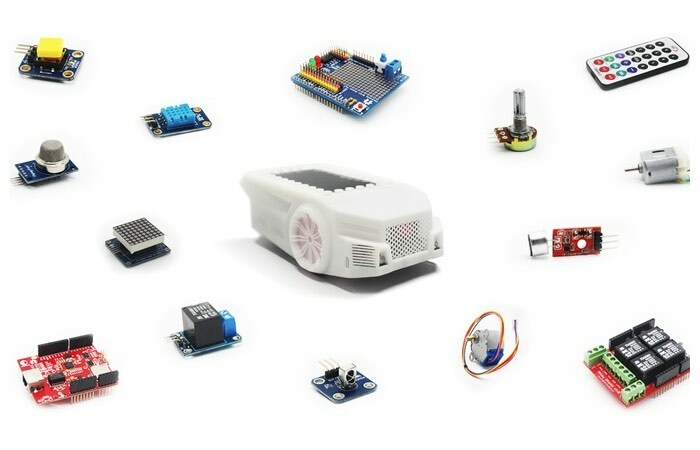 The Blinkgogo robot kit has everything you need to get started allowing users to demonstrate many standard robot functions right out of the box say its developers, who explain a little more about the inspiration behind the new Arduino robotics kit and its features. – Binkgogo play right out of the box Tutorial: Blinkgogo works right out of the box. You can demonstrate many standard robot functions. You can drive it by controlling it with your phone through it’s Bluetooth capability. Or have it follow a black line. – Blinkgogo for Advanced Users Tutorial: Blinkgogo offers a lot for advanced users. Blinkgogo comes with a hardware expansion prototyping plate where you can mount servos and many other sensors. Supports sound effects and plays music. Open source exterior case, so you can design and 3D print a completely new and unique enclosures. Blinkgogo also comes with a hardware expansion board for those who really want to go wild when is comes to trying new things and developing new robotics systems. For more information on the new Blinkgogo Arduino robotics kit jump over to the Kickstarter website for details by following the link below.